Take a sky ride on the newest attraction in Destin - Destin Helicopter Tours! Book online for any tour through 5/22 and save $5-10 per person. The tours range form 5 miles to 38 miles and depart daily (sunrise to sunset). Helicopter tours are great for all ages. You will see dolphins, sharks, rays, and more on your journey! Destin is home to one of the largest fishing fleets in the Southeast. If you're planning to this little fishing village, there is one thing you must do - Fishing! For some of us, the thought of going on a long voyage out to sea sounds uncertain due to the potential for sea sickness and heat exhaustion . Let's face it, some of us are not boat people! In addition, the prices for fishing can exceed $150 per person for even the shorter trips that don't make it affordable for families. That's why we recommend booking party boat trips (known as head boats) because they offer an experience for those first timers or budget trip seekers. Book your Destin fishing trip today for rates starting from $45. Spring has sprung and Summer is right around the corner. Make Big Kahuna's Waterpark your vacation destination while visiting Destin, FL. Save $5 OFF over 48 inch. 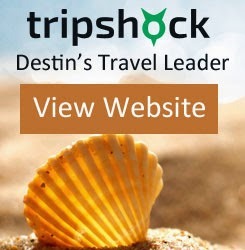 tickets when you book on TripShock thru 5/22 ($4 Off After 5/22). The Park is open nearly every day Memorial Day to Labor Day. The Crab Island Excursion is Destin's newest tour that allows people to enjoy this popular sandbar and social boating attraction without the worry. Renting your own pontoon boat can be challenging because of the risk of damaging the boat because you are in such close proximity of other boaters. You may also want to kick back and have a few drinks without worrying about getting a BUI (boating under the influence). The tour includes a captain and crew that will show you a good time. The boat has bathrooms and facilities to safely store your items and coolers. Meet new people on this trip and enjoy the emerald green water. This trip is recommend for all ages. Book online today for this great offer. Parasail in Destin starting from $39! Don't worry about coupons because this price is guaranteed. Fly singles, doubles or triples at this great price. Experienced and licensed captains with excellent safety records. Must book for dates prior to 5/22 for this offer. Book these following properties May 1st-May 22nd and August 16th - October 31st for 4th Night Free. TripShock.com will include 4 FREE dolphin cruise tickets with each stay and other giveaways. This is a beautiful condo located on scenic hwy 98 that is small, but quaint. The majority of the property is 2 bedroom condos that all share panoramic beach views. This is the perfect place for a more relaxed and quiet beach getaway. Sterling sands is located in the central part of Destin on the stretch of Highway 98 known as "condo row". This complex features 2 and 3 bedroom condos with stunning panoramic beach views, pool, and hot tub. It's a great place to stay with the family as there are activities and attractions close by.